The Beijing Olympics are big, no doubt about it. But what do you do if you’re a blogger who’s blog doesn’t cover anything to do with the 2008 Olympics? How can you take advantage of one of the most watched events in the world? Let’s take a look at some ways even the most unrelated blog can take advantage of the Olympics, and jump on the lucrative bandwagon. There’s usually some way you can link your topic to the Olympics, even if it takes some imagination. If you write about technology, why not cover the tech used in the Olympics, either as part of the sport or as part of the coverage. You could also write about getting the best home kit to enjoy the Olympics at home or emulate the athletes in the comfort of your reader’s home gym. If you look hard enough, you can usually find a link to anything, given the size and complexity of the modern day Olympics. And when you do find something, try and put an interesting twist on it, a new angle that may not have been covered elsewhere. Gizmodo recently posted an article about the technology used in Olympic fencing, which is a great example of this tactic. Remember, you want to get some Olympics related keywords and topics into your post to pull in the traffic. You can take advantage of the fact that the Olympics are featuring so heavily on websites and on TV by echoing some of the terminology used. So instead of saying something is the best in its class, say it won the Gold Medal! You want any good will the reader is feeling for the Olympics to bleed over onto your blog. This is probably the most effective way of exploiting the Olympics. 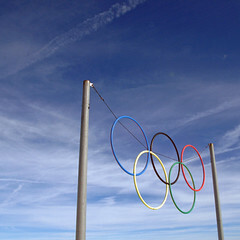 If you usually offer something through your blog, for sale or for free, you can begin to tailor them to the Olympics. For example, if you write Photoshop tutorials, do a tutorial on how to create an Olympics poster. If you give away free website themes, why not do an Olympics theme. It’s worth pointing out that these tips can be applied to any popular event. So consider the upcoming US Presidential Elections for example. Do you do anything on your blog to take advantage of popular events?